Ingrown or Internal sprouts on potatoes are a defect when a potato begins to sprout, but the sprout grows into the flesh potato instead of growing outward. I have only seen this a few times over my career as an inspector, but I have never seen this severe enough to score as a defect. This defect is to be scored as an internal defect, allowing more than 5% waste for damage and more than 10% waste for serious damage. At shipping point, the U.S. Grade Standard allow 5% of the potatoes with internal defects, while at market, or destination, the tolerance for internal defects is increased to 7%. USDA inspectors will make preliminary “exploratory” cuts on 5 random potatoes looking for inernal defects for each sample. If this defect is found, or any scoreable internal defect is found, then the inspector will cut a 20 pound sample looking for internal defects. 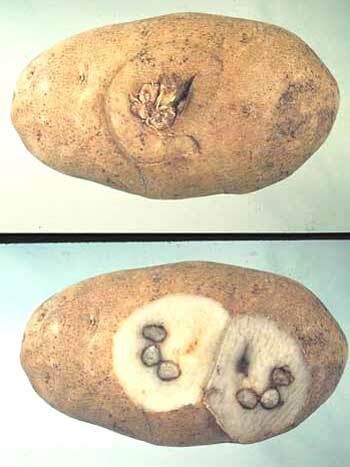 This is a picture depicting ingrown sprouts on potatoes. As always I am looking forward to hearing from you regarding this topic……should this be considered an internal defect if the presence of internal sprouts can be detected externally? Have you ever seen this defect? Have you ever scored this defect, or rejected a load of potatoes because of ingrown/internal sprouts? #1 I always wondered why it is an internal defect when in most cases it can be detected externally. The processing standards classifies it as an external defect and the fresh standard calls it an internal defect. #2 The defect can be fairly common in some lots, it usually shows up later in the shipping season. We tend to see it more in the processing varieties. I believe it has to do with the sprout inhibitor applied by gas in the storages. Sometimes the proper rate may not have been applied. #3 With either grade we scored it with a 5 or 10 waste cut. Upon checking the U.S. Standards of Potatoes for Processing, the grade does indeed list ingrown sprouts as an external defect. §51.3416 Classification of External Defects. I am confused. One standard classifies ingrown sprouts as an internal defect, while another standard calls it an external defect??? Is that possible? We inspect a lot of potatoes in our market. We see ingrown sprouts every now and then. If we see the defect, we score the defect. You can’t worry if you find it in your first five potatoes or your last five potatoes. It is still a defect. If we always followed the rules no one would be happy. Our applicants are paying good money for an inspection and they expect us to find and score the defects. How could we tell the applicant we weren’t allowed to score the internal defect because we didn’t find it in our first five potatoes? C’mon! Sometimes you have to bend the rules. It is called “using common sense”! By the way, our applicants are happy and our inspection work is up. Regarding comment #2 from the state supervisor. I have also seen the defect on seed potatoes that do not get the “sprout nip”. This was at Shipping Point years ago. It was like the lot got the peepers going and put the cold air to the bin but could not turn the sprouts off so they grew inward. I have experienced the sprouts growing all the way through out the other side of the potato. The lot was full of it. Internal Sprouts have always had external indcators when I have seen them.